as to join the anti-Christian Liberals Union. The message was clear from authorities, go for the Christians. Just let King County Prosecutor Dan Satterberg, Seattle, Washington State, try his corrupt tactics on a gay individual, or a policeperson accused of a crime then see watch what happens. This is why the team of Judge Lori K. Smith, Prosecutor Nicole Weston, Prosecutor Dan Satterberg, Prosecutor Jason Simmons, Prosecutor Rich Anderson, Prosecutor Lisa Johnson, Prosecutor Mark Larson: manipulated a hate crime presented zero evidence a crime had been committed – they were after a Christian Church as Governor Jay Inslee had set into motion the bias of Washington State. Be sure and pick up your Gay Safe Sticker otherwise the Police will be sure and move forward hate crimes against Christians. Anything for the police, including Enumclaw Detective Grant McCall scripting an accusation for a False Accuser. “As a case in point, he cited a recent discussion in Seattle with several dozen college students from schools around the state. The group was chatting about everything from tuition to the arts, when Mr. Inslee lobbed a question from left field: 3“OLYMPIA, Wash. — In his office, Gov. Jay Inslee keeps a framed image of a stand of magenta paintbrush, an alpine meadow flower and a signature species in Washington, that he photographed while hiking with his wife in Olympic National Park. The magenta paintbrush is threatened by global warming, and the photograph is a reminder, Mr. Inslee said, of all the things that are at risk. But then he paused and said, no, a beautiful blossom was not the point: The deeper reason he is pushing for tough new air-quality policies is to combat worsening health problems, like asthma in children, that are caused by pollution. “It’s not the flowers,” he said. “It’s kids’ lungs.” The line encapsulates Mr. Inslee’s practical approach to advancing one of the most ambitious environmental programs in the country. He has proposed collecting a new charge on emissions from oil refineries, power plants and other industries that would reap an estimated $1.3 billion in the first year. But in contrast to similar systems in California and the Northeast, energy experts said, Mr. Inslee’s plan would use most of the new revenue for education and transportation rather than on climate or energy projects. By linking the money to broadly popular bread-and-butter programs, he hopes to build support for an antipollution policy that faces stiff opposition from Republicans and some industry groups. He is also trying to solve two problems with one policy. Washington has been cited for contempt by the state’s highest court, which said the government violated the State Constitution by underfunding schools by billions of dollars. “You don’t even have to allude to climate change,” Mr. Inslee, a first-term Democrat, said in an interview. “One can support this simply on the fact that you want to support the education of your children.” Though the fate of the plan is unclear — the Republicans who control the State Senate have vowed to fight it, and Democrats, a majority in the House, have not pledged an all-out defense — it underscores how Mr. Inslee operates. He is less interested in winning the debate over climate change than in achieving his goals. You have 2 free articles remaining. Subscribe to The Times “It’s really unfortunate that it came to be seen, by some people at least, through a partisan political lens,” Mr. Inslee said of the climate debate. “But I do think the ice is breaking.” Critics are not so sure. “Governor Inslee wants to try to drive this global warming agenda in a state where you can really say we are already leading the way,” said State Senator Doug Ericksen, a Republican and chairman of the chamber’s Energy, Environment and Telecommunications Committee. Adding carbon charges now, he said, would hurt the economy and kill jobs. But to environmentalists — who have occasionally complained that Mr. Inslee is too cautious — the carbon plan is groundbreaking, making him a national leader of what they say is a quiet movement to find practical solutions to daunting environmental problems without regard to politics. Editors’ Picks There Are No Five Stages of Grief ‘S.N.L.’ Cold Open Skewers Michael Cohen Hearings With Stiller and Hader The Meaning of the Scene: Sean Spicer Repents For instance, former Gov. Rick Perry of Texas, a Republican, backed a big wind-power transmission project in his state, even while saying climate science was unsettled. Georgia reduced carbon emissions from electricity production by 35 percent from 2005 to 2012, more than twice the national average, and its Republican-controlled legislature recently passed a bill expanding incentives for homeowners to install rooftop solar panels. “There are just more concrete steps being taken,” said Keya Chatterjee, the executive director of the U.S. Climate Action Network, a nonprofit advocacy group. “We’re affected — what are we going to do about it,” she said of the new efforts. Shooting for results, even if sometimes incremental, was a hallmark of Mr. Inslee’s 15 years in Congress. He favored greater wilderness protections on federal land, but when that was not politically feasible, he shifted to the middle ground, defending rules that discouraged development of roads in forests and on other lands. Those rules were ultimately left intact by the Supreme Court in a 2012 ruling. In a debate over water quality as governor, he supported what he called a balanced plan — tightening some pollution rules while leaving others alone. “Jay has always had a clear eye on the bull’s-eye, the goal he’s trying to achieve, and also an understanding of what he has to do to get there,” said Bill Arthur, who has watched Mr. Inslee for 30 years at the Sierra Club, where he is the deputy Western campaign director for the Beyond Coal campaign. “He’s smart and savvy enough to know, ‘I’ve also got to speak in a language and speak in terms that can resonate with a larger contingent of people.’ ” Mr. Inslee, 64, a fifth-generation Washingtonian who grew up in the Seattle area, said he owed part of his appreciation of the natural world to his father, Frank. Frank Inslee, a high school science teacher, often led the family on volunteer expeditions to replant alpine meadows on the slopes of Mount Rainier, the glacier-clad volcano south of Seattle. But money for education, a key to Mr. Inslee’s carbon plan, was also the starting place for his political career in the 1980s, when he was working as a lawyer in a small town in central Washington that needed to build a new high school. The fight over the school’s funding led him to run for his first public office, in the legislature. He jokes that now, in trying to link emissions to education, he is back where he started. Sign Up for On Politics With Lisa Lerer A spotlight on the people reshaping our politics. A conversation with voters across the country. And a guiding hand through the endless news cycle, telling you what you really need to know. His plan is also a kind of throwback, environmental researchers said, to familiar — and politically popular — taxes long applied to alcohol or tobacco. “We’re starting as a society to see carbon emissions as a bad, and by framing it the way he has, he brings it into the sin-tax way of seeing things,” said Mark Stephan, an associate professor of political science at Washington State University who studies environmental politics. “Inslee is packaging the policy in a way that makes it more politically palatable.” Mr. Inslee’s opponents, especially in the State Senate, remain unconvinced. Washington, they said, already is an environmental leader; the percentage of its power that comes from renewable energy is among the highest in the nation. Hydroelectricity generated by dams on the Columbia River and its tributaries dominates the power grid of Washington and the Northwest. And long before Mr. Inslee was elected in 2012, they said, the state was reducing its dependence on carbon-based energy. Washington had the biggest percentage reduction in carbon dioxide emission from power generation of any state between 2005 and 2012, according to the Georgetown Climate Center, a research arm of Georgetown University Law School. In March, the Senate passed a transportation-funding bill of its own, with a phased-in, 11-cent-per-gallon increase in the gasoline tax. The House passed its own plan — different from the Senate’s vision but similar in leaving out any mention of Mr. Inslee’s carbon proposal as a funding mechanism. A spokesman for the governor, David Postman, said that the means to pay for the Legislature’s commitments had not been determined, and that Mr. Inslee would continue to promote the carbon bill as an answer. “There are apparently a handful of members who need to be convinced, and the governor will certainly be talking with those folks,” Mr. Postman said in an email. Under Mr. Inslee’s program, the state would set an overall cap on carbon emissions and require the state’s biggest polluters to pay for each metric ton of pollution emitted. The price would be set at an auction, and buyers of emission allowances could sell the amounts they did not need. The governor’s allies on environmental issues are already talking about taking his ideas directly to voters in a referendum, perhaps in 2016, if the Legislature does not pass them. Mr. Inslee, in the interview, declined to say what his next steps might be — or his strategy in the final weeks of the legislative session, which ends in late April. He said only that he remained deeply optimistic. As a case in point, he cited a recent discussion in Seattle with several dozen college students from schools around the state. The group was chatting about everything from tuition to the arts, when Mr. Inslee lobbed a question from left field: How many of them believed that humans were significantly contributing to global climate change? Everyone raised a hand. “Unanimity is pretty amazing,” he said, shaking his head.” [Washington Governor Puts Focus on Climate Goals, and Less on Debate – The New York Times]How many of them believed that humans were significantly contributing to global climate change? Everyone who doesn’t “raise a hand” for the “amazing” “unanimity” had better be pretty worried about the coming legal bully tactics for Governor Inslee is already tipsy with power. Had Governor Jay Inslee asked those who do not believe in global warming to raise their hands and then cautioned everyone else to respect, listen and attempt to work together that would have been a positive step. That each group could work together to solve various environmental problems, though for differing reason, that would have been productive. Instead like the Prosecutors that surround him he intimidates, isolates and savours his power. Ugly. It is clear in the State of Washington you had better tow their political, and Bible doctrines, or they will allow the hatred, the boycotts and prosecutions to unrelentingly unfold. Governor Jay Inslee threatens violence to take it “outside” because in his heart he is “amazed”, “shaking his head” at his own power. Governor Inslee, though elected in Washington made these comments coming off his State of Indiana boycott, global warming arm raising speech and ignoring the calls for a serious investigation into the hate crime in Enumclaw Washington. A foundation of lust for power is fueling the groundwork already laid down by King County Prosecutors. Mike Reynolds, City Attorney and advisor to the Enumclaw Police and Prosecutor for the city of Enumclaw Washington and landlord for Athena Dean Holtz Redemption Press, on many occasions, before multiple witness, in and out of meetings, repeated the truism confirmed by others who know, that “only gays and minorities receive any justice,” down at the King County Court House. 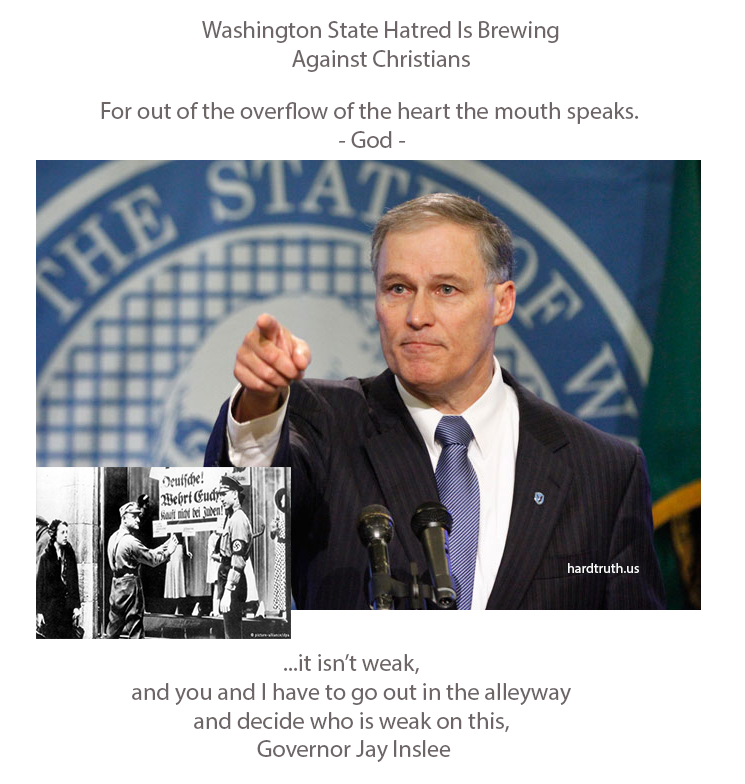 What can you expect from Governor Inslee that declares an embargo on Indiana, walks gay judges up court steps while ignoring justice for others, enthralled with students who lift their hands in salute to global warming but then mocks to take it “outside” when it doesn’t suit him. If you are serious about everyone’s rights you had best take a moment call Gov. Inslee and clearly communicate the requirement to appoint a special investigator into the hate crime against Sound Doctrine Church, Winepress Publishing, Salt Shaker Christian Bookstore and Timothy Williams. Ignore his excuses, as there are plenty of things he can do just as he did for those who believe in being gay. Governor Jay Inslee of Washington imposed an embargo on the State of Indiana seeking to deny earning a living to anyone who is not gay enough. That was the second level start for the Nazi’s toward the Jews. It was this hated Prosecutor Jason Simmons, and Expert Prosecutor Mark Larson ensured was inflamed like a book burning at a Nazi bon-fire against Sound Doctrine Church. In fact, the last 3 minutes of jury summation Prosecutor Jason Simmons declared the “church will go on” and “Timothy Williams writes the books.” By that time the jury was primed and ready for the lynching so they we back, came back and shut down the church. The State of Washington relished attacking Sound Doctrine Church, Winepress Publishing and Salt Shaker Bookstore because it involved Christianity. Prosecutor Jason Simmons from day one stated, “heard it was a cult” and then proceeded to obstruct the truth. The joke is everything is called a cult these days and the word is so meaningless it is easy to prove that King County Prosecutor Satterberg is running a cult down at King County. In fact, Malcolm Fraser was denied a bond hearing. In fact, Malcolm Fraser was denied a bond hearing and a judge set Mr. Fraser’s bail without ever hearing one word from the defense. To repeat, there was no lawyer at Mr. Fraser’s bond hearing because Prosecutor Dan Satterberg manipulated the law so that no bond hearing take place. Everything becomes “legal” because every illegal move has a law in place to make it appear legal. Thus Prosecutor Dan Satterberg’s prosecutors lie as they tell the truth. Like Nazi Germany there was a massive uptake in the number of laws to make injustice legal. If Prosecutor Dan Satterberg’s office doesn’t want to give a bond hearing there is a law to cover that and if he does want to allow a bond hearing there is a law for that also. Since judges will not hold back prosecutors all we are left with are agenda driven prosecutions and governors. In short, Prosecutor Dan Satterberg is telling the truth and lying at the same time because Governor Jay Inslee is only interested in political gain that can come from attacking Christians. Then at the legal-lynching, like the judges in Germany the Honorable Judge Lori K. Smith2http://www.kingcounty.gov/courts/SuperiorCourt/judges/smith.aspx literally sat on the bench allowing King County Prosecutors to make Bible doctrine the reason to send Malcolm Fraser to prison for life. It is common knowledge that King County Courts and especially Prosecutors have been anti-Christians for years. Governor Jay Inslee bullied the whole State of Indiana all because a section of individuals in Washington State do not mind a Nazi style attack of livelihood upon Christian shops. Naturally the Nazis did it all in the name of the law and for the rights of all Germans. The lesson should be learned that Hitler got ahead by legally entrapping the Jews. The same thing will happen to Christians if we do not demand that Governor Inslee figure out how to protect everyone’s rights starting with those in Washington State. In fact, it just wouldn’t be that difficult if the courts and Governor Inslee were not so hell bent on forcing their beliefs on others. The Wenatchee abuse of power is in Seattle, King County, Washington State – Prosecutor Dan Satterberg’s home territory. Governor Inslee of Seattle in Washington State like Governor Gregoire before him, along with Seattle’s Prosecuting Dan Satterberg understand that to get ahead politically in Washington State one needs to pursue a sensational prosecution. Prosecutors, Judges and Police (see video below) all understand it is how the injustice system in Washington State achieves its self-centered goals. What do we expect from a man who followed the example of x-Governor Christine Gregoire, one of the prosecutors who should have her law license removed for being a prosecutor in the witch-hunt surrounding the Wenatchee child legal abuse. Athena Dean Holtz knew exactly what hate crime to vomit at Prosecutor Dan Satterberg. “The ACLU was thrilled to learn of Satterberg joining, though it could be an uneasy relationship. The group periodically sues King County in First Amendment cases. The ACLU also has aided defendants in misconduct cases against King County prosecutors. An ACLU spokesman said the group has no figures on the party affiliations of its new members. He said it’s a myth the group is solely liberal anyway. Vance, who is one of the few “Never Trump” Republicans who have remained vocal since the election, said Satterberg is “a classic moderate Republican”— the very type who might be troubled by Trump’s norms-smashing overreach. It will be interesting to see if any broader Trump concern spreads in the GOP. Despite Friday’s court victory in the travel-ban case, Trump skeptics have very little political clout in the national government. It will be difficult to check or mitigate his more extreme actions without some healthy skepticism also coming from within his own party. Republicans don’t have to go so far as to join the anti-Christian Liberals Union. Though if they want to, it’s never been more open for business.